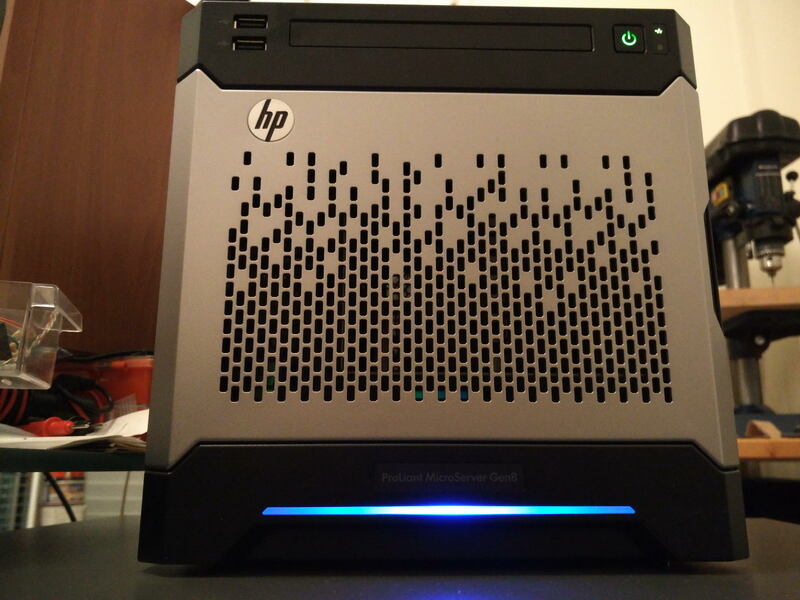 I’ve been a fan of HP’s Microserver line for many years. I bought my first one in 2011, my second one in 2013 and my third one a few days ago. All of them are running non-stop since I bought them. They have proven to be true Proliant servers, in the sense of having good reliability and build quality. 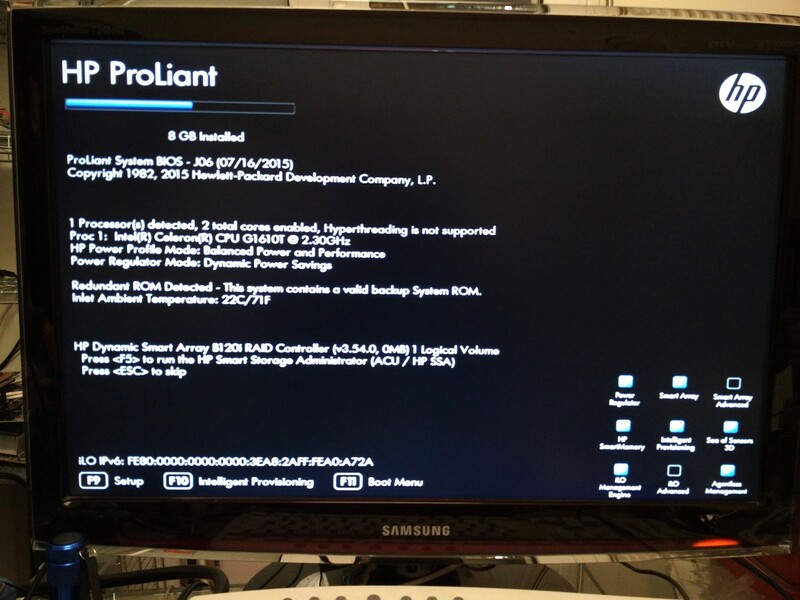 But the latest one (Gen8) is by far the most “Proliant” of them all (more on that later). 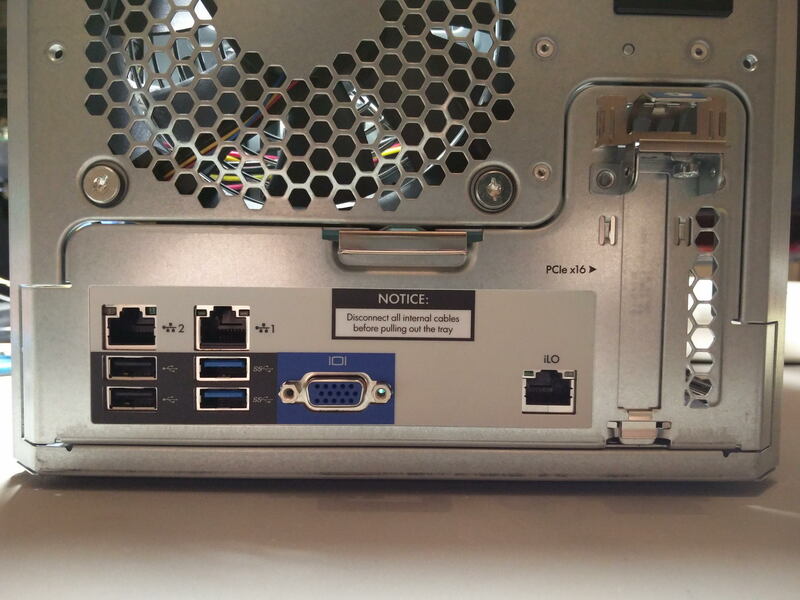 It has pretty good connectivity, since it comes with 7 x USB ports (2 of them USB 3.0), 3 x GbE Ports (one of them is the dedicated iLO port, more on that later), one PCIe x16 slot, etc. It supports 4 internal HDDs and an internal slim DVD-RW drive. 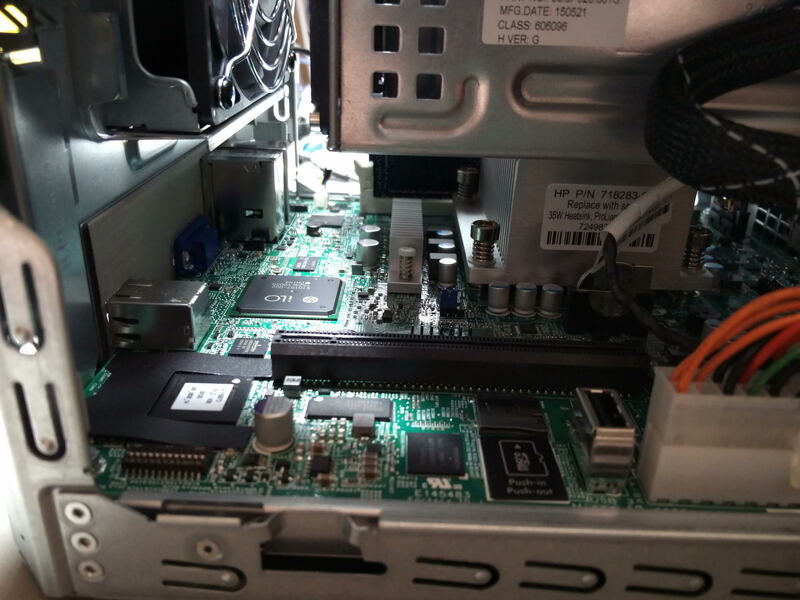 Since it is 2016 (no-one needs DVD-RW drives any more), I decided to make better use of the server’s fifth SATA port by using it to connect an SSD system drive. Getting the SATA cable from the mainboard to the top of the case was no problem, but powering the SSD was. 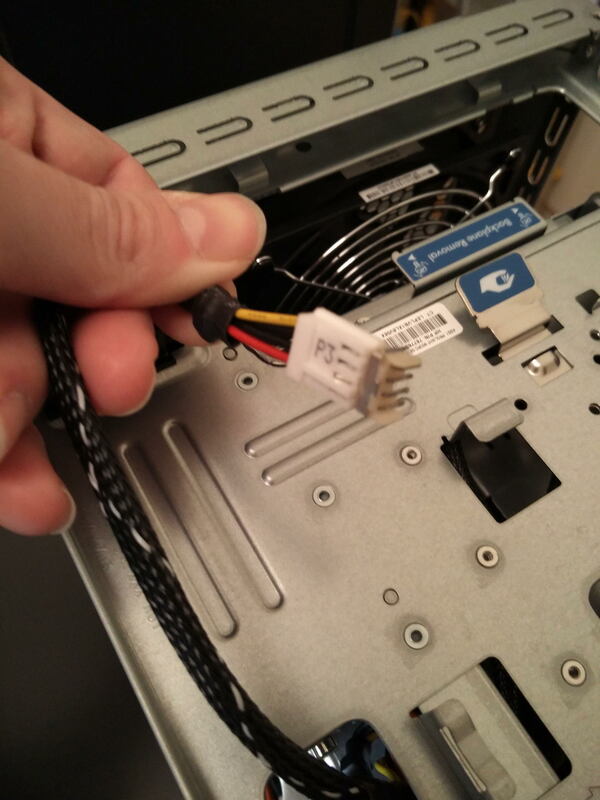 The server has a spare power connector, but it is meant to power HP’s DVD-RW drive which (oddly enough) has an old floppy drive power connector. 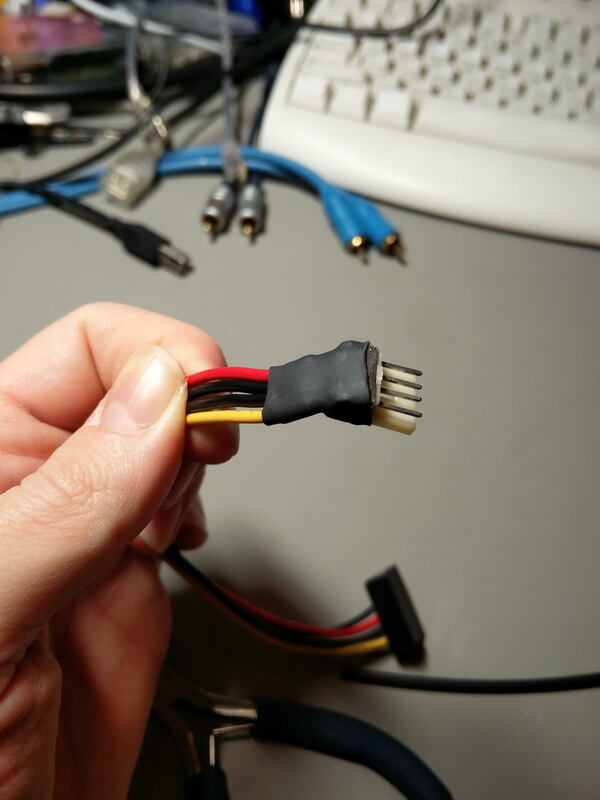 I did not want to cut the cable and splice in a proper SATA power connector, so I did the sensible thing. 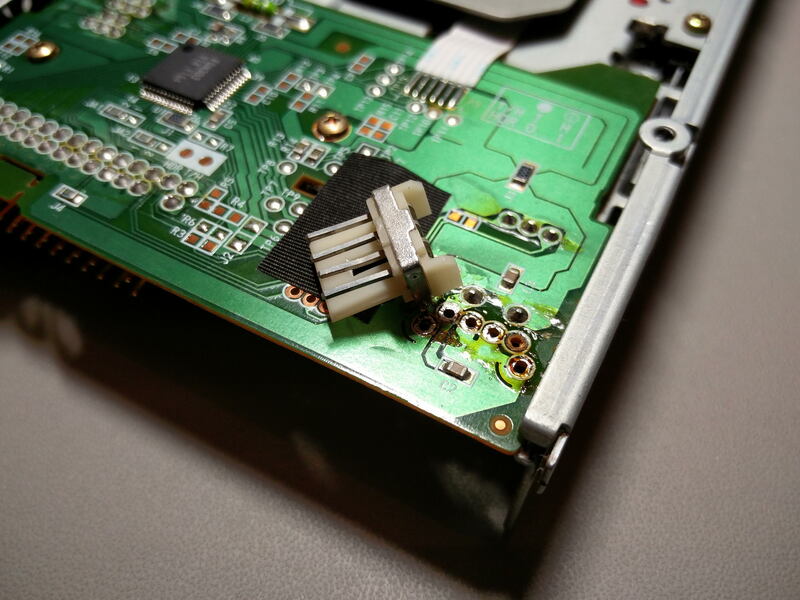 I robbed an old floppy drive of its most precious component: Its power input jack. I made sure that it mated properly with the server’s connector. 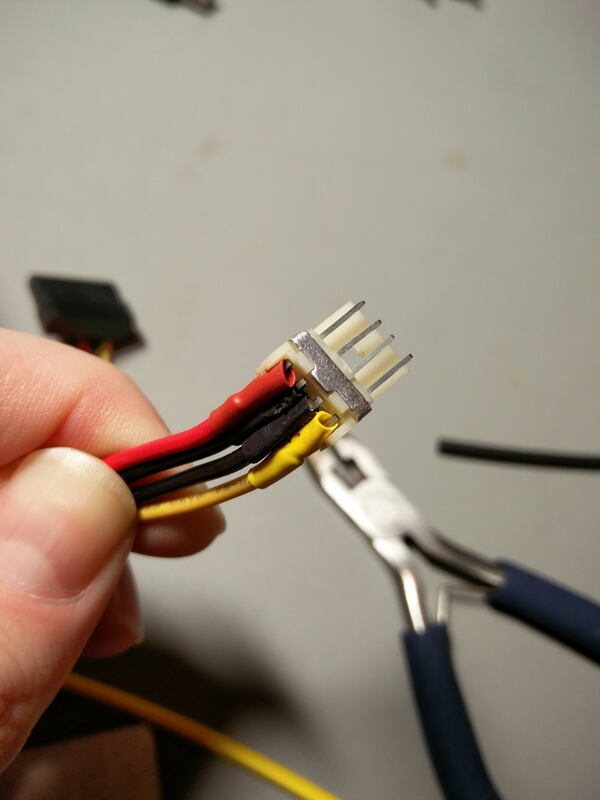 And I soldered on an old SATA power cable I had. I used heat shrink tubing (of proper colors of course :P) to make sure that there would be no possibility of shorts. So now I had my SSD installed and it was time to install the OS. This is where things get interesting. Remember, this is a proper Proliant server. What this means is that it has a pretty strict operating system compatibility list, and no consumer OS are officially supported. So, Windows Server 2012R2 and 2008R2 are OK, Windows 8.1 is not. I normally run Windows Home Server 2011 (which is based on Server 2008) so I should be OK, but I decided to get started with a trial of the full fledged Windows Server 2012R2 (just for the experience..). 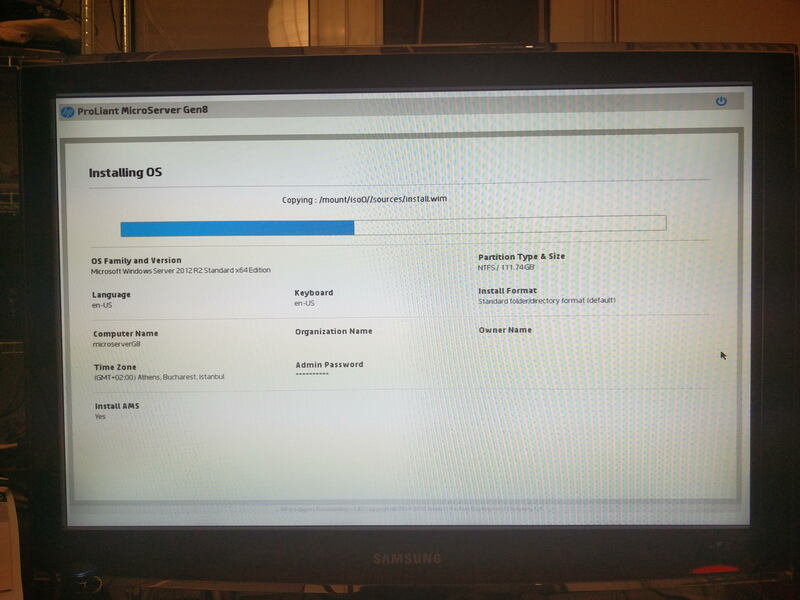 Installing an OS is supposed to be a simple procedure. HP’s Intelligent Provisioning takes care of drivers and server applications for you, but before you get to that there are a number of things to do. We are dealing with an actual server here, so inexperienced users should definitely start by reading the manual or at least the quick start guide that comes with the server. If you do not do that, you should not expect to get very far. You will waste a few hours, wondering why Windows is not installing and what you are doing wrong. One of the first things to do is to decide whether you want to make use of the server’s Dynamic Smart Array RAID controller of not. You have a choice. You may run it either in AHCI mode (a.k.a. “dumb mode”) or in RAID mode. There are merits to either mode. If you go the AHCI route, you will get to keep your drives’ existing data (which would be wiped clean if you went the other way) and that data will be visible from other machines if you decide to take the HDDs out and put them inside some other machine. So the main drawback is noise. That’s right, the server’s main fan will run a lot quieter if you set your Smart Array controller in RAID mode. In fact, this way it will run even quieter than the previous generation of Microservers. I chose to go this way. So, first order of business is to create an array. You may create a RAID0 or 1 array if you have 2 or more drives or RAID0 if you have one. 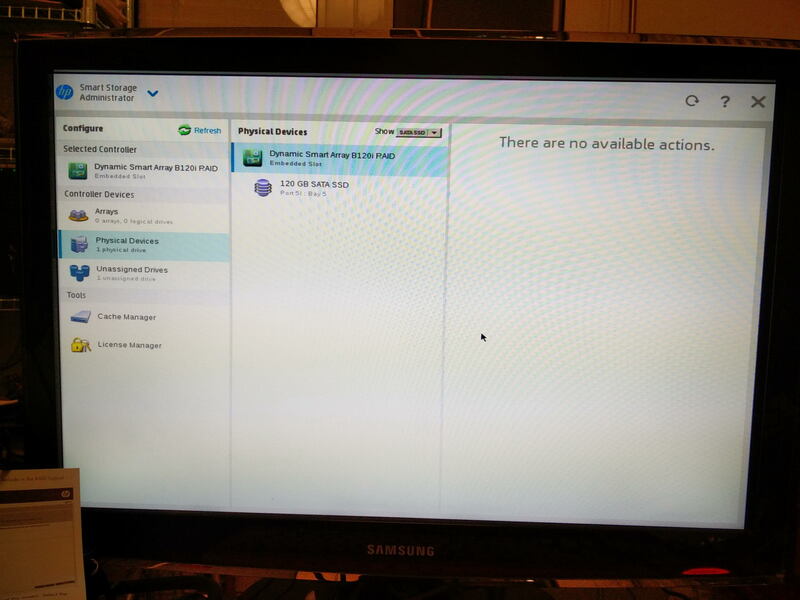 I would have a number of drives in my server, but I did not want redundancy, so I started with one RAID0 array consisting of my SSD system drive. Next up was a firmware update for the server’s subsystems. There is a bewildering array of firmwares that may need updating. Good thing that the process is automatic and is done from within the server’s BIOS, before you install the OS. The same goes for driver updates – they are downloaded automatically before the OS installation begins. Note that the firmware & driver updates come from HP’s web site (obviously..), so you should have at least one ethernet cable connected to your ethernet switch. The server will use DHCP to get on your network. Keep in mind that the firmware update when done this way is actually not very effective, meaning that chances are that there are newer versions of your firmwares available from HP’s site, but you should not worry about that just yet. Do use HP’s Intelligent Provisioning to install your OS of choice, preferably from a USB installation medium. I know that there exist unofficial (and thus unsupported) ways to install non-supported operating systems, such as Windows 8.1, but I have not done any serious research into them. YMMV. The server will reboot (several times actually..) and you should be patient. Each reboot takes more than 2 minutes, since the server does extensive testing of its subsystems (processor, memory, controllers, iLO, etc). You may have noticed that I now have 8GB of RAM installed. I added a 4GB ECC DDR3 DIMM that I had bought for my first Microserver (from 2011). I no longer see the “Genuine HP Memory” message since it is (if I remember correctly) a Kingston DIMM, but I do have twice as much memory, so I can live with that. This memory stick is not officially supported, and it is a bit slow compared to the one that came preinstalled, but it works just fine and 8GBs of RAM offer much better overall performance than 4GBs. Once you have Windows installed, you should got to HP’s site and register your server. This way you will have access to official support plus HP’s up-to-date ISO file (Service Pack for ProLiant) with all the latest drivers, firmwares, etc. You should mount that ISO image and install the relevant software. You will get useful tools for managing your Smart Array controller, making firmware and driver updates, viewing logs, etc. You should also make use of your iLO 4 system. It will give you remote access to your server’s console without having a monitor connected (up to the time that the OS loads) and a bucketload of diagnostic information such as fan speed, temperatures, etc. Once I had the OS installed, I moved my 4 x 3TB WD RED drives from my old Microserver to the new one, one at a time (copying the data through the network link). Now I’m waiting to receive a PCIe e-SATA controller that is compatible with the Gen8 Microserver so that I can connect my Lian Li DAS enclosure with its port multiplier interface and its 5 extra SATA drives. 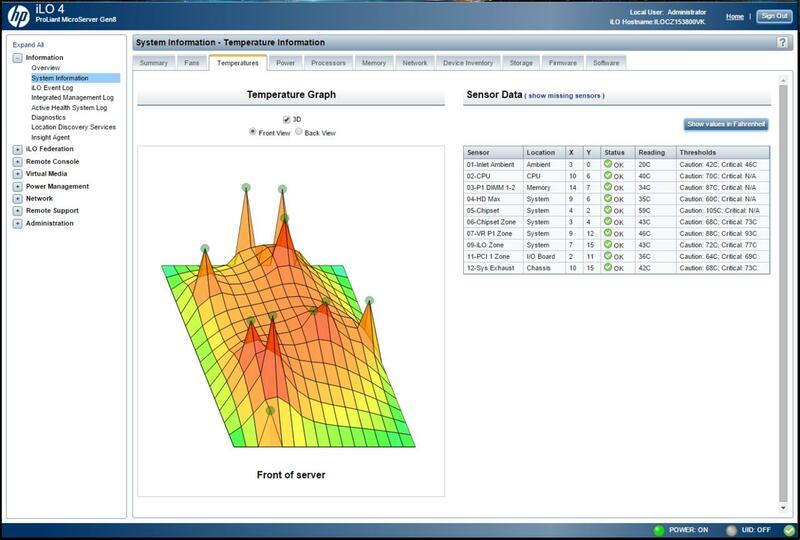 This entry was posted in Computing and tagged HP, Microserver, Proliant, Windows by Dimdim. Bookmark the permalink. Are you sure that the cable that you bought will do the job? It doesn’t look right.